eLearning content comes in different sizes and formats with endless combinations to suit the different needs of different organizations across diverse industries. When you are looking to implement an eLearning strategy in your organization, you will inevitably face the decision of either choosing a bunch of readymade courses or developing a custom eLearning program. So how should you make that call? The answer depends entirely on the industry you operate in, the type and size of the audience you are catering to, and the intent of your training program. For example, if you are in the restaurant business and want to train your employees on government-prescribed health and safety standards, it’s probably best to choose a readymade course that specializes in this area – it makes no sense to reinvent that particular wheel. However, if you are in the insurance business and want to train your sales force on the latest investment-linked product you have just launched, custom eLearning development that taps into the specifics of the product features and benefits while taking into consideration the skill level of your sales team makes more sense. Having said that, here are the reasons when you should choose one or the other. You need to train employees on generic content: Readymade courses are relatively cheap and require very few internal resources to manage. They are ideal for providing generic eLearning content: from safety training to basic product information, soft skills to compliance training. However, since they are not designed to meet the unique needs of your organization, they do not address specific goals and therefore, might provide you with information that is irrelevant too. You have budget and time constraints: Readymade courses are ideal for organizations that have budget and time constraints. Since ready-made courses can be used again and again for multiple different users, they are extremely cost-effective. Moreover, you can also use individual components, modules, media elements and animations for different purposes and contexts. They also help save a great deal of time, since most of the content is already developed and available to buy from a ready catalogue. You have just a few employees: Since readymade courses come with subscription or license costs, they can get expensive as more and more user licenses need to be purchased. For example, if the monthly cost per user for a readymade course is $20, in a span of 2 years, the organization will incur around $480. But if there are 100 employees, the training cost will shoot up to a whopping $48,000! You need to train employees on organization-specific content: Although custom eLearning projects are costlier, require high design and development skills, and take longer to develop as compared to readymade courses, they can meet your organization’s specific training needs. They can be used to train a highly specialized audience effectively. Custom eLearning courses are ideal when you have to train your employees on aspects that are specific to your organizational culture or processes: from onboarding to employee enablement for company-specific rules and regulations, organizational process training to product-specific sales training. Also, they do not require you to purchase additional licenses and can be easily modified as and when required since you have complete ownership of the content. You are catering to a varied audience: If your audience is varied with people from different ages, backgrounds, countries, cultures, learning needs, and abilities, a custom eLearning course will ensure each course is designed for their learning needs and abilities – without being redundant or challenging. 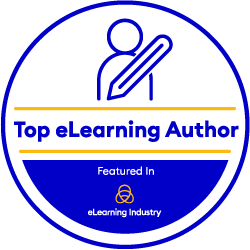 Since every learner will have his/her own technical requirements, limitations and preferences, developing custom eLearning courses with just the features and activities your learners need, will result in better outcomes. You operate in a dynamic industry: If you belong to an industry where new developments happen regularly, custom eLearning courses can help you keep up with the latest industry developments and trends. You can periodically update your courses and ensure they provide meaningful learning content that is always current and topical. Custom eLearning courses also work well for businesses that are growing; if in the near future, your company expands operations to other countries, you can easily create multilingual versions of the same course and embed culture-specific aspects, without affecting the learning impact. With the eLearning market expected to be worth $200 billion by 2024, the growth of the industry is set to be colossal. Generic, one-size-fits-all, off-the-shelf readymade courses work well for organizations looking to impart basic knowledge such as how to use basic software or information security best practices. However, if you are looking to provide training in core business practices or organization-specific software and systems, you should consider developing a custom course from scratch as per your needs. In the end, there isn’t a formula to help you decide when to use a readymade course and when to go for custom eLearning development. In most cases, a combination of the two works best: readymade courses can cover all the general training topics and custom eLearning courses will capture your organization’s unique requirements and competitive advantages. The synergy can make your training more impactful and effective – while providing better ROI. If custom courses are what you are looking for, we at eNyota have 11 years of experience in building them for corporates located in the US, UK, Europe, and Australia. Our custom courses range from simple slide based courses to custom animation and simulation-based courses. If you’re interested in knowing more click here and one of our sales personnel will get in touch with you shortly!